Many of you will remember that song from Sunday School. Unfortunately, it is happening now at the children’s home. The roof got damaged in a recent storm and now when it rains, water comes into the house. If you remember the pictures, it is in the area where the bamboo couches are located. Also, once again the house is flooding. The low block wall around the house was not enough to block the water running down the hillside on Sunday. It ended up flooding the house up to their knees (the adults). 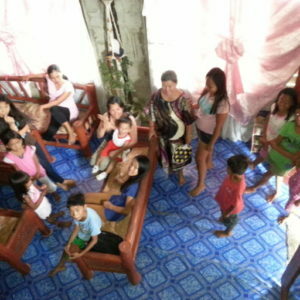 Inday, asked for $60.00 if possible so she can buy materials to fix the roof. She will fix it if we can supply the money for the materials. She’s aware that we don’t have the funds available right now, so she is going to try to make do until we can send her the money. I ask that you will remember them and the needs in prayer.